A big, quick, expensive card. But its also a slightly flaky, unreliable one thats arrived rather late to the ultra-enthusiast graphics party. To me it almost feels like the graphics card market simply doesn't know what to do with itself this year. In the lull before the next-gen consoles start making demands upon hardware once more we're at a stage where the graphics power we've got is arguably good enough. And so no-one wants to release their next-gen GPU architectures right now. When you consider the pixel-pushing grunt that's sitting in today's £200 cards it's no wonder neither GPU manufacturer is in a rush. Instead, AMD and Nvidia are busy launching ultra high-end graphics cards based on their existing tech - and this homebrew HD 7990 from AMD is the latest. "Each GPU has a 1GHz boost clock. Nifty, huh?" This card is at once something we've already seen and something new. Some of AMD's partners have already created single-card/dual-GPU variants themselves, with the likes of Club3D and Asus grabbing headlines for top-end performance. Indeed AMD themselves helped design parts of their partners' cards. Now AMD have decided it needs to put out a reference version of the card to really flesh out its graphics card stack. So, here we go again. Essentially we're looking at another HD 7990 made up of a pair of the GPUs which power the HD 7970 GHz edition. This time though AMD have opted to keep the clock speed on this dual-GPU card similar to the single-GPU version. That means each GPU has a 1GHz boost clock. Nifty, huh? By 'utilitarian purposes' I assume AMD mean that the Radeon HD 7990 isn't just a graphics card for people wanting the outright fastest performance, but for people wanting the ultimate experience. This is exactly the same way Nvidia were selling their GTX Titan a few months back. So the AMD Radeon HD 7990 is their GTX Titan. Unfortunately it certainly doesn't have the luxury aesthetic of the Nvidia ultra-enthusiast cards, and nobody is making up phrases like trivalent chromium plating here. Granted, it is incredibly well engineered, and the cooling solution is very impressive, especially considering the massive triple-slot cooling solution Club3D needed for their version. "It's the fastest reference graphics card in the world, and yet I just can't get excited about it. It's tech we've already seen." The noise levels are excellent too, even at full load. AMD have been talking about not only making sure it's quiet in terms of decibels, but also in terms of the tonal quality of any noise it does make. And the fans on the AMD Radeon HD 7990 are at once quiet but any noise is a lot softer than the somewhat harsher tones of the GTX 690, or even the also impressively quiet GTX Titan. But it still kinda feels like wasted effort - this card effectively already exists in the wild and yet AMD is trying to make out that it's new and something of a big deal. It is though very, very quick and the HD 7990 has the GTX Titan beaten in every benchmark test we put them through. 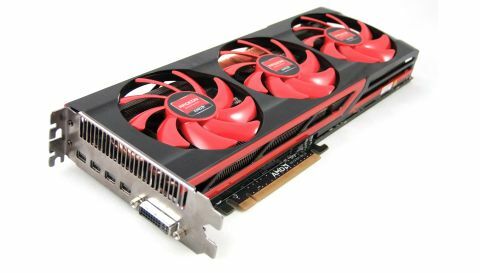 Thanks to the power of the Tahiti XT it also holds its own ahead of the similarly dual-GPU GTX 690. So in those terms it's a win; the fastest reference graphics card in the world. And yet I simply can't get excited about it. It's tech we've already seen and despite the fact that most of the time it's running the GPUs at standard HD 7970 GHz speeds it still gets beat by a pair of AMD's top cards in CrossFireX trim. Which are cheaper, though admittedly a fair chunk more power-hungry. But AMD have been talking about the Radeon HD 7990 as a card that delivers the best experience, not necessarily the fastest frame rates. So it shouldn't matter if it's a little off the pace compared the CrossFireX pairing. Except that I struggle to see where a multi-GPU card can make for a smooth, simple, consistent gaming experience. I can't help but distrust single-card/multi-GPU solutions. Putting two cards in one system can often be a recipe for trouble, and that's only magnified when you're squeezing both those cards onto one elongated slab of PCB. It's probably drivers more than hardware, but this was one of the flakiest cards I've reviewed in this generation. Sometimes one GPU wouldn't spin up and sometimes both would, seemingly at random. "It's probably drivers more than hardware, but this was one of the flakiest cards I've reviewed in this generation." I'm sure that's mainly down to immature pre-release drivers, and I did eventually get some really impressive benchmark numbers out of it once the card had settled down. But that still starkly illustrates that it's very easy for some broken drivers to ensure a less than premium experience when you can't get your ultra-enthusiast, ultra-expensive multi-GPU card operating happily with the very latest games. It's this spectre of driver issues that worries me about calling this incredibly well-engineered card the ultimate experience in graphics. A top, single-GPU card that offers performance only a little way behind, but consistently so, would get my vote. That said, if you're talking about ultra high-resolution gaming AMD's CrossFireX represents the only real, affordable option of getting playable frame rates, at the highest settings, at multi-screen resolutions. But that's an incredibly niche sector of PC gaming, and in any case the raw performance, and higher minimum frame rates, of the HD 7970 GHz edition cards in CrossFireX trim would be your best bet for moving towards 4K gaming. All the tests were carried out on an X79 test platform with 16GB DDR3 at 2,133MHz at 2560x1600 on the highest settings with 4x AA. The initial numbers are the performance in average frames per second and the numbers in parentheses are the minimum frame rate throughout the benchmark.